Madrid, Spain, 2017-Nov-05 — /Travel PR News/ — The Secretary-General of the World Tourism Organization (UNWTO), Taleb Rifai has visited Madagascar to express the Organization’s full support to the tourism sector. Madagascar’s tourism is facing a challenging situation following a plague outbreak which has prompted some countries to implement travel restrictions with Madagascar. 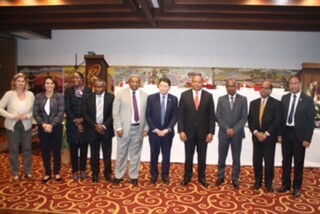 Mr Rifai recalled the World Health Organization (WHO) advises no restriction on travel or trade on Madagascar. This entry was posted in Adventure Travel, Arts and Culture, Attractions, Hospitality, People, Society, Tour Operators, Tourism, Travel, Travel & Environment, Travel Agents, Travel Issues, Travel Management, Travel Safety, Travel Services, Travel Tips & Info, Travelers, Trips and tagged Air Austral, Air Madagascar, Madagascar, Najib Balala, Roland Ratsiraka, Taleb Rifai, UNWTO, WHO, World Health Organization, World Tourism Organization, World Travel Market. Bookmark the permalink.